A roof rack is often chosen for roof transportation. It’s the ideal extension for transporting long pieces such as ladders, boards, tubes or beams. Mounting is possible on every commercial vehicle. In most cases, fixation points are already provided by the manufacturer. The combination of anodized aluminum and stainless steel not only ensures a long lifetime of your product, but also a low self weight. This makes it possible to load the roof rack as much as possible, taking into account the maximum roof load stated by the builder. For all roof racks, sleepers are being used that can handle a load of at least 200 kg each. Production indoors guarantees short delivery times. 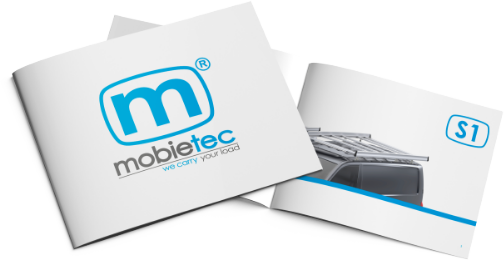 mobietec roof racks are standard equipped with a wind deflector. This spoiler makes sure that the air current flows over the roof rack and the car in an almost noiseless way. In case of commercial vans without tailgate, a ladder roll is also standard provided. Thanks to this roll, ladders or other long objects can easily be loaded onto the roof rack.